Often used as a garden decoration or as a theatrical prop, this beautifully handcrafted reenactment cannon evokes all of the drama of the largest battles of the Civil War. The body's pine wood construction means that it's lighter to lift and easier to transport than rival models, and its all-American handcraftsmanship - each cannon is built by a small woodshop in the northern United States - promises an unparalleled level of quality and longevity. *Please note this cannon cannot be fired. 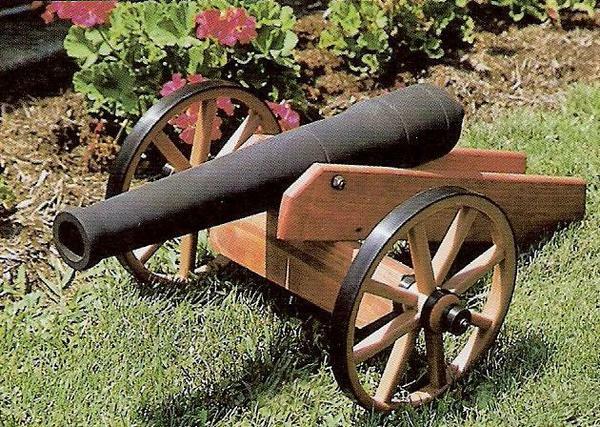 Please don't hesitate to give us a call or an email if you've any questions at all about this beautiful cannon - we would love to hear from you! Note: This item usually ships within 3-5 days. We are able to provide a shipping date but not tracking number at this time. Barrel Diameter: 2" - 3"
*Note - This cannon cannot be fired.